One last thing…The London stock market outperformed its French and German rivals today, to finish 61 points higher, or 1%, at 5898. US factory orders shrank by 2.9% in December, according to new data – the biggest drop since the end of 2014. The one prediction he has stuck to that had, up until now, looked pretty uncontroversial was that the next move in rates would be up rather than down. But, in the past few weeks even that has now come into question…. Stephanie Flanders, JP Morgan’s chief market strategist for Europe (and former BBC economics editor), says weak wage growth could scupper a rate hike this year. The bottom line of today’s report is that the UK cannot ignore the weakening of global growth prospects – particularly the weakness of global trade – and neither can the Bank of England. But domestic consumption is driving the recovery in the UK and the US and the Bank of England can see little reason to expect domestic consumption to grind to a halt. On balance, we still expect the US Federal Reserve to raise rates again over the course of 2016 as recession worries recede and sentiment in emerging market economics starts to stabilise. 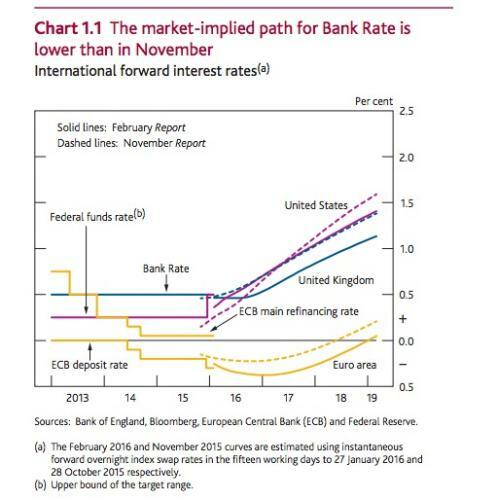 In that environment, we would expect the Bank of England also to raise rates by the end of 2016. However, much will depend on domestic wage pressures, which look somewhat weaker now than they did 6 months ago. Back in 2014, Mark Carney was labelled the “unreliable boyfriend” for giving mixed messages about possible rate rise timings. Today, it felt like the governor was playing a defensive husband, denying that he ever misled the public while insisting that he’ll still raise rates at the right time. The prospects of an early UK interest rate rise have receded, after the Bank of England left borrowing costs at a record low of just 0.5%. The Monetary Policy Committee voted 9-0 to leave rates at 0.5%, with noted hawk Ian McCafferty abandoning his calls for a rise. 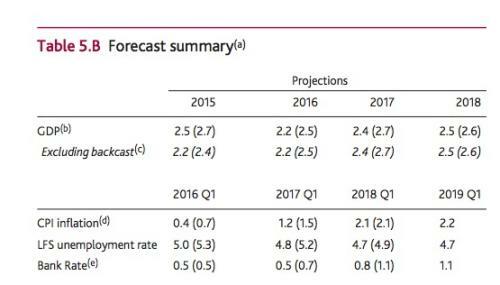 The BoE has slashed its growth forecasts. It now expects GDP to rise by just 2.2% this year, not 2.5%, as Britain is hit by the weakening global economy. 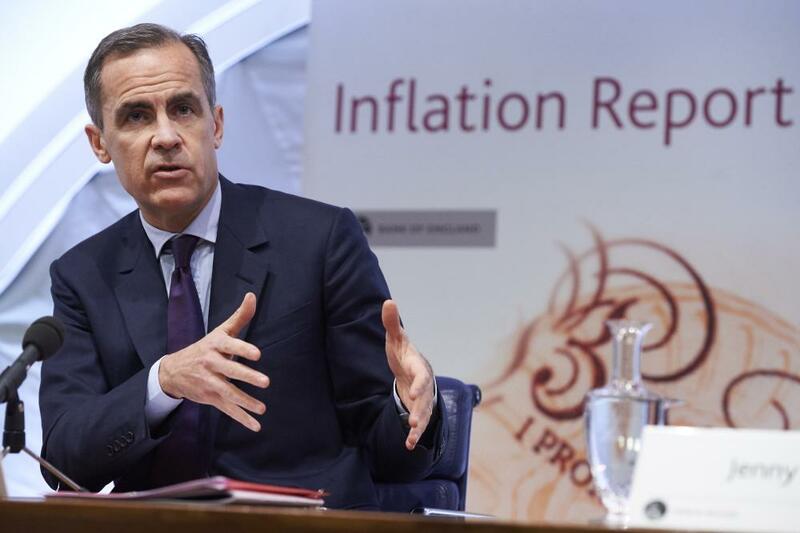 Mark Carney has insisted that interest rates are still more likely to rise, than fall. The governor faced down a sceptical press pack in London, who reminded the governor that his previous forward guidance on the path of interest rises has proved somewhat unreliable. Carney also rejected criticism for telling households recently that interest rates were “more likely than not” to rise in 2016. He said his original forward guidance, that rates would stay on hold until the economy improved, had given businesses and households confidence. But he tried to play down the idea that Britain could follow Japan and the Eurozone into imposing negative interest rates. Carney said a rate cut hasn’t even been discussed at this week’s MPC meeting, but the committee does keep its tools under review. And asked about the EU referendum, Carney said the Brexit risk has had some impact on the pound. That’s the end of the press conference. The press pack are scrambling back to their newsrooms, and Mark Carney has headed back to his office to keep the monetary wheels in motion. I’ll pull together a summary shortly. Q: Negative interest rates are now in place in Japan, the eurozone, and Switzerland, so are they within the Bank’s toolkit? Carney replies that the bank thinks interest rates are “not at the lower bound” – in other words, they could be cut further. We will review our toolkit, he continues. But we have not discussed negative rates, as monetary policy is pointing in a different direction. He reminds the reporters that they saw the minutes of this month’s MPC meeting, while they were locked in a room “being treated pretty badly and forced to read a bunch of documents”*. Another questions about Brexit — what contingency plans have the BoE taken? 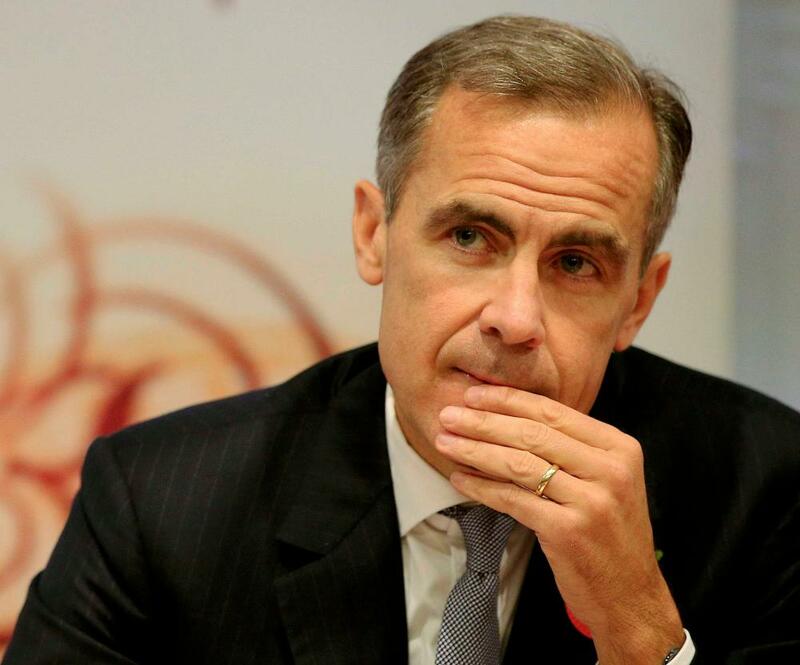 Carney declines to reveal any details, but suggests that – like with the 2014 Scottish referendum – the Bank will reveal its homework after the event. Q: Are you worried, governor, that you might go through your entire tenure at the Bank without raising interest rates? Carney insist he’s relaxed about this prospect. He points out that former policymaker David Miles did two terms without raising interest rates, but did plenty of other things such as quantitative easing. The important thing is that we set policy to maximise the changes that we meet our objectives. That’s how we’re going to be judged. Q: How worried is the Bank of England about the global economy? 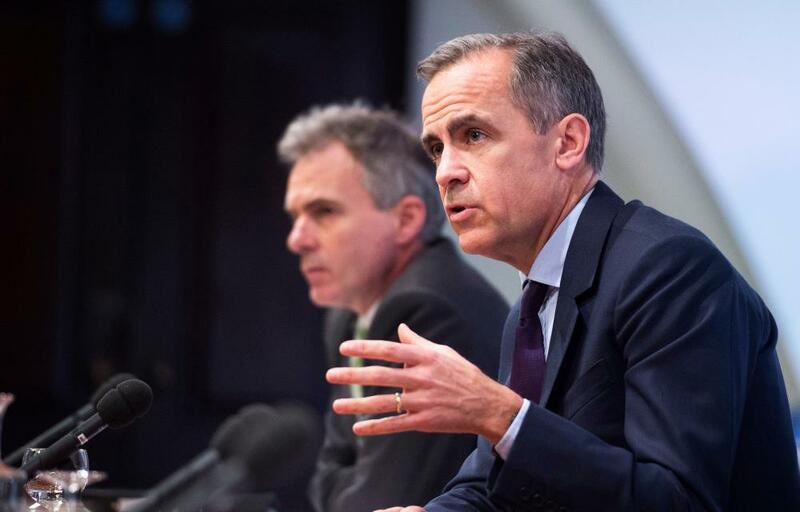 We do see some downside risks, Carney replies. Britain is a particularly open economy, so it’s very vulnerable to global problems. That’s why the Bank of England usually has lower growth forecast than other bodies, such as the IMF. He cites market fears over China, and its knock-on impact on other emerging markets. And monetary policy could tighten more quickly, if those upside risks develop. BoE's Broadbent: fears over deflation voiced in this press briefing a year ago haven't come true,"don't think we should overemphasise risks"
Q: When does low inflation start to become a worry for the Bank? Carney bats this question over to Ben Broadbent. Broadbent says there’s “no simple level when it becomes an over-riding concern”, but the bank is watching wages closely for signs that inflation is weakening. Now deputy governor Ben Broadbent takes the microphone, insisting that there’s no ‘mechanical link’ between the UK output gap and any interest rate move. You might remember that the output gap was one measure cited by Mark Carney in 2014, when he took his second stab at setting forward guidance on interest rates. So, it’s still a factor, but don’t expect it to trigger an interest rate hike. Feels like forward guidance is dead as Carney says: when it comes to making each decision we won't be bound by something said in the past. We won’t be “bound by past comments” when we decide it’s time to raise interest rates, says Carney. Carney: We won't be bound by what we've said previously. #Carney first question on rate CUT…..
"whole MPC stands by forecast that first rate move will be higher"
Dear UK Public. Carney and the BofE are guessing. They haven't got a clue, don't wait for them to tell you your future. Our economics editor Larry Elliott asks Carney when the decision about rate rises will come into “sharper focus” again. Carney denies that the MPC are looking at monetary policy through bleary eyes. We take a decision at every meeting. This week’s decision was “easy”, though. Carney gets a question about the European Union referendum. He says the Bank of England isn’t modelling for ‘parallel universes”, so today’s report doesn’t estimate the impact of Brexit. He argues that there isn’t yet a “big risk premium” due to the possibility of Britain leaving the EU. However, there has been some impact on the pound as investors seek protection ahead of the referendum. Carney on brexit effects: we assume the status quo and not parallel universes when making our forecasts. Mark Carney is trying to argue that the financial markets are underpricing the chances of a UK interest rate rise. The Bank did send a signal that they think the market is wrong about when it thinks rates will rise. Investors think the first rate rise won’t come until February 2018 and the Bank has tried to say they should bet on it coming sooner. Carney is now warning that there could be more slack in the labour market than first thought. That would mean wage growth might be disappointing (as firms wouldn’t have to fight for workers as much), meaning inflation remains weak. But he also points to the introduction of the national living wage, which should raise inflation a bit. (from April, workers in the UK aged over 25 earning the minimum rate of £6.70 per hour will get a 50p per hour increase). Q: Do you think the public gives your advice as much credibility as it used to, given previous guidance on rates? Carney gives a long answer, defending his original forward guidance (he originally set a 7% jobless rate as a key target before considering a rate rise, only to backtrack when it was achieved sooner than planned). The worst thing we can say about that guidance is that more people went to work earlier – and we’re not going to apologise for that, Carney smiles. And he’s also happy that UK households believe rates may rise this year, as it means they are less likely to risk a credit splurge. Although households have made “great progress”, they are still pretty indebted. Carney insists, though, that the MPC will never “tie its hands” to changing monetary policy at a certain time, or at certain events. And in short, we have nothing to explain, he concludes — a classic central banker’s answer to criticism. Q: Does Mark Carney still believe interest rate are more likely to rise, rather than fall? Absolutely, the governor replies, and so does the monetary policy committee. He reiterates that the market path of rates implies that inflation will overshoot the 2% target in the medium term unless borrowing costs are hiked. Interest rates are more likely than not to rise during the forecast horizon, says Carney. He points to the current “market path” for interest rates (where investors expect borrowing costs to be). On that path, inflation will hit its 2% target in the medium term, and then rise higher, meaning higher borrowing costs will be needed. We’ll do the right thing at the right time, on rates. Carney: uk financial system is resilient. matched by resilience of uk private sector. Business and consumer confidence measures "robust"
Carney: mpc expects average hours worked in uk to resume downward trend. Productivity has picked up. Carney says the Bank of England expects real incomes in the UK to grow solidly this year, after several lean years. And business investment should also continue to grow strongly. Carney then warns that global financial conditions have deteriorated notably recently, with a “particularly challenging” outlook for trade. #Carney speaking now: "global growth has slowed again", despite boost from lower oil price and fiscal fillip in developed economies. The governor of the Bank of England is giving a press conference now, to discuss the quarterly inflation report. Mark Carney begins by saying that the UK economy is in much better shape than in March 2009 when rates were first cut to 0.5%. Seven years ago, the economy was in serious trouble at the height of the financial crisis, and heading into recession. Today, we have sluggish global growth, turbulent financial markets, and a resilient UK economy. And that’s why the Bank still expects the UK economy to keep growing. The Bank of England has also taken a knife to its growth forecasts, admitting that the UK economy is not expanding as fast as expected. It now expects GDP to rise by just 2.2% this year, down from 2.5% three months ago. And for 2017, it has cut its growth forecast to 2.3%, down from 2.6%. Global growth has fallen back further over the past three months, as emerging economies have generally continued to slow and as the US economy has grown by less than expected. 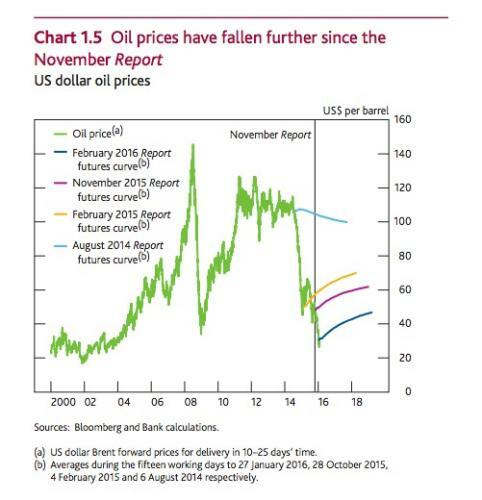 There have also been considerable falls in the prices of risky assets and another significant fall in oil prices. The 9-0 vote means that Ian McCafferty has abandoned his calls for interest rates to rise. He had been the lone hawk on the MPC, arguing that borrowing costs should go up now before inflation took hold. But with oil so cheap, and growth weakening around the globe, he’s had a rethink. Breaking: The Bank of England has voted to leave UK interest rates at their current record low of 0.5%. And the decision was unanimous, with the Bank’s monetary policy committee voting 9-0 not to alter borrowing costs. We have less than 30 minutes to go until Bank of England announces its interest rate decision, at noon in London. It will also release its latest quarterly inflation report, with new forecasts for growth and inflation. And half an hour after that, Mark Carney will hold a press conference to discuss the report. This is the third “Super Thursday” — but frankly, the first two haven’t lived up to this billing, thanks to the lack of pressure to raise interest rates and the mediocre global economic outlook. How the department overseeing the trade descriptions act have not intervened in the use of the term ‘Super Thursday’ when the Bank of England posts its inflation report and interest rate decision, is somewhat baffling. Anyway, the smart money is on another ‘no change’ in interest rates, followed by plenty of questions about the darkening global outlook, deflation fears, and whether Britain could follow Japan and the eurozone into imposing negative interest rates. Ed Conway, writing for Sky News today, points out that borrowing costs could be cut this year. Households should prepare themselves for a possible UK interest rate cut this year, with investors betting that there is now a greater chance that the next move in borrowing costs is down not up. Money markets are now putting a one-in-four probability on the Bank of England reducing its official rates below the 0.5% level they have been sitting at since 2009. It follows a dramatic shift in their expectations for interest rates. Back in Brussels, Pierre Moscovici has explained that his latest forecasts don’t factor in the prospect of Britain’s leaving the EU. Why not? Because everyone’s committed to avoiding such an outcome. Moscovici: we are all fighting to avoid #Brexit and that is why it is not in the forecast. Greek economy performed better than Commission expected, in response to question about why forecasts always wrong. Precondition is that reforms in Greece continue, pension reform is most difficult – Moscovici. Shares in London have been lurching around like a well-refreshed journalist leaving The Inkwell after last orders (I imagine). After jumping almost 90 points at the open, the FTSE 100 index slowly subsided until it was only up 20 points, before getting a second wind and romping ahead again. 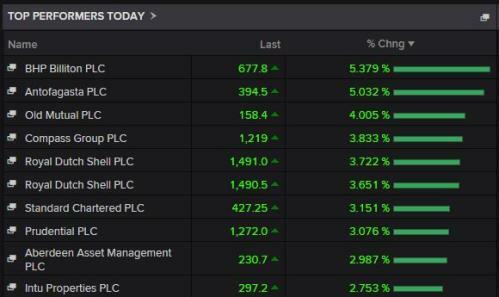 Mining companies are still leading the way, with Anglo American leaping by 11%, BHP Billiton gaining 8% and Antofagasta up 7.5%. So why the wild lurches? Investors are trying to decide how much optimism to take from the rally in the oil price, and the sudden weakness in the US dollar. This could mean that the turmoil in the commodity market is reaching a bottom, especially if the US Federal Reserve is backing away from raising American interest rates several times this year. The City is also waiting for the Bank of England to deliver its quarterly inflation report, in an hour’s time. Ilya Spivak, currency strategist, at DailyFX, says markets expect a “dovish outcome”. Traders are currently pricing in a 64% chance that rates remain unchanged over the next year, and a 36% probability that rates are cut to 0.25%, he adds. Commissioner Pierre Moscovici is briefing the media now, about the EC’s new economic forecasts. It's a controversial statement but refugees speed up growth, says Moscovici. Unemployment forecast for 2017 Greece 23%, Spain 19%, Italy 11%, euro ave 10% – it's called the European recovery. In new forecast, @EU_Commission still insists #France deficit will miss 3% deficit target in 2017. Now predicting 3.2% of GDP. Better #Greece debt numbers in new @EU_Commission forecast also better than Nov: "only" peaking at 185% of GDP this yr, rather than 199.7%. Despite those headwinds from China and refugees, the European economy is now entering its fourth year of recovery, says the EC. Growth continues at a moderate rate, driven mainly by consumption. At the same time, much of the world economy is grappling with major challenges and risks to European growth are therefore increasing. A flurry of news is flying our way from Brussels, as the European Commission releases its new economic forecasts. The headline event is that the EC has slashed its forecast for inflation this year to just 0.5%, from 1% three months ago. That’s partly because of the oil price, and also because “wage growth remains subdued”. 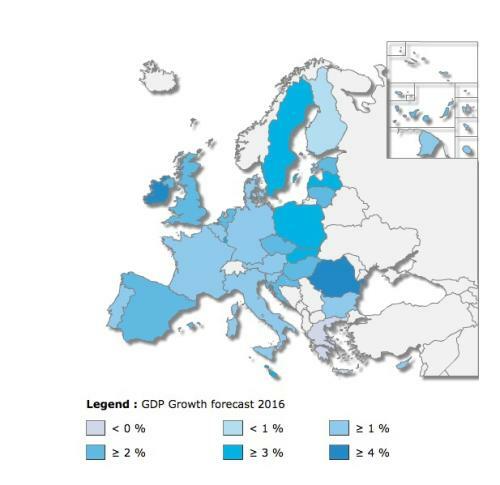 It has also trimmed its growth forecast for 2016 to 1.7%, down from an earlier forecast of 1.8%. The EC still expects eurozone GDP to rise by 1.9% in 2017, as the slow recovery picks up pace (a little). 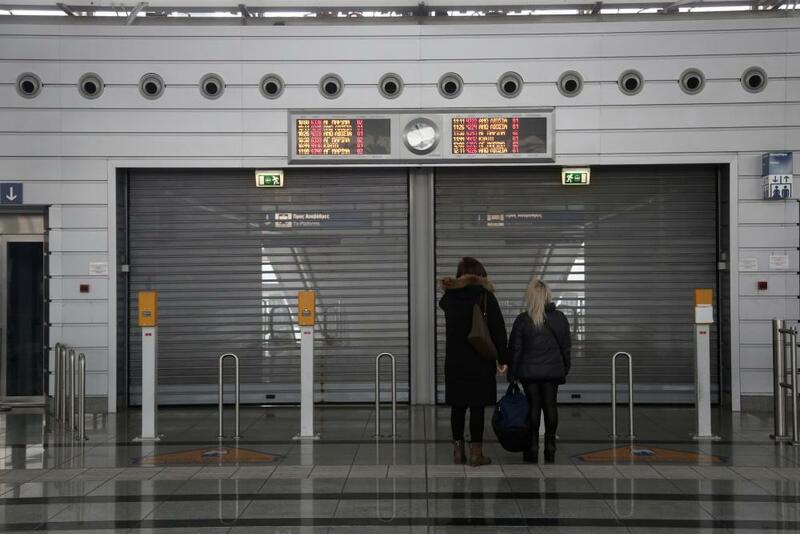 The Commission blames problems in emerging markets, and also points to the refugee crisis. The EC has also revised up its Greek forecasts, saying the economy didn’t actually contract in 2015. It also expects a smaller recession this year. Greece is in the grips of a general strike today as demonstrators renew their protests against the country’s latest bailout deal. 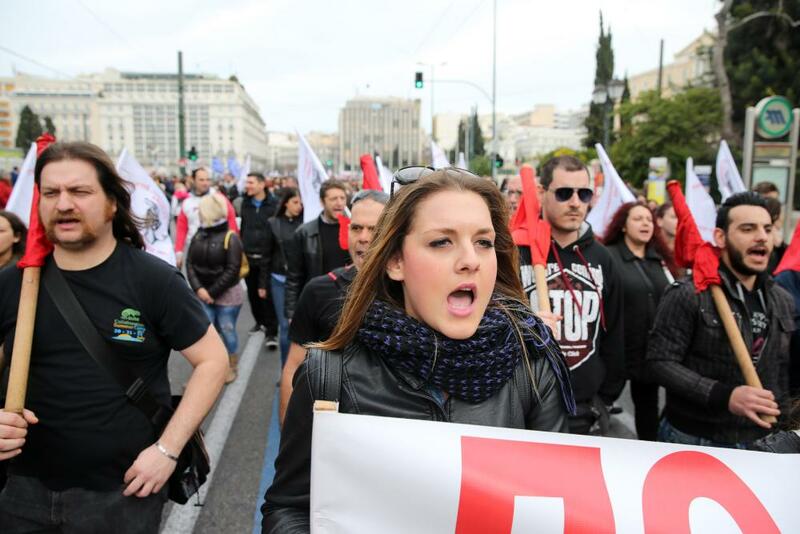 Transport links are shut down, shops are closed, and thousands of people are marching through the Greek capital right now. Our Athens correspondent, Helena Smith, reports that the effects are withering. 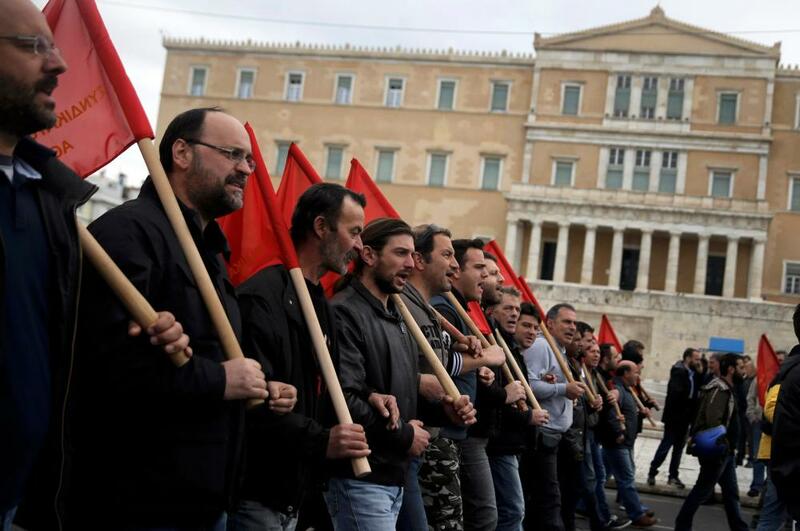 This is the fifth general strike since the leftist Syriza first came to power but none has been so fully endorsed. In a reflection of the growing anger at all embracing tax and pension reforms, the entire country appears to be paralysed by industrial action supported by every walk of life. In Athens, where almost nothing is open, streets and central boulevards resembled a ghost town this morning with the shutters down on shops, offices and ministerial buildings. Small businesses, which usually turn a blind eye to the pleas of unionists to stay closed, have today heeded their call. “We have no choice,” said Lakis Antonakis who owns the popular Piazza Duomo café opposite the capital’s cathedral. 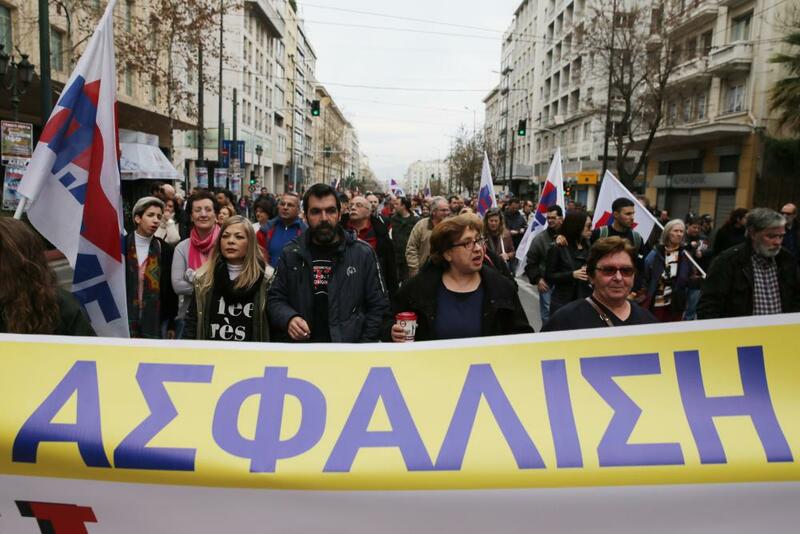 Unionists, who planned mass protest rallies, attributed the high turn out to the determination of Greeks to ram home the message that they will not accept pension and tax reforms as they now stand. International creditors, led by the IMF, are pushing prime minister Alexis Tsipras for further cuts in pensions to make up for a fiscal shortfall of up to €4.5bn over the next three years. Grigoris Kalomoiris, of the civil servants union, Adedy, said he also thought Greeks had been encouraged by protesting farmers who have set up roadblocks nationwide. “Their action over the past two weeks has had a ripple effect. Everything is close even the state audit office,” he told me. The strike, ironically, has the full support of Syriza – although government officials, who will soon be called to vote on the reforms, are keeping mum. You might have expected the euro to fall this morning, after Mario Draghi guilefully declared that central banks shouldn’t stop taking action to fight deflation. But the single currency didn’t take the hint. Instead, the euro has hit a three-month high against the US dollar, at $1.116. And that’s starting to weigh on European markets, pushing shares down from their earlier highs…. Sales of Volkswagen cars slumped by almost 14% in the UK last month, suggesting that the company is still suffering from the emissions scandal. Just 12,055 VW-branded cars were registered in January, down from 13,993 in January 2015, according to new figures from the Society of Motor Manufacturers and Traders. That cuts VW’s market share to 7.1%, from 8.5%. 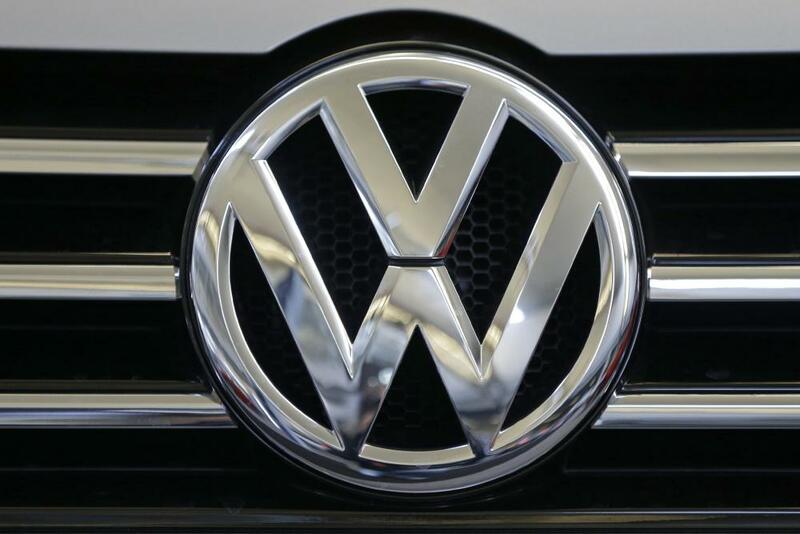 Other Volkswagen brands also had a bad month. Sales of Seat cars slumped by 25%, from 4,137 to 3,119. This is the fourth month in a row that VW car sales have dropped, following last year’s revelations that it used cheat software to get around emissions tests. 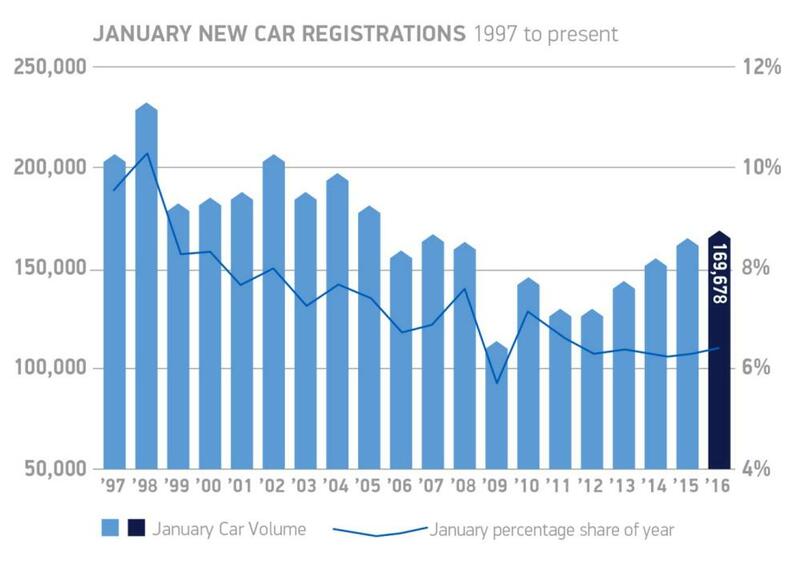 Overall, the UK’s new car market got off to a positive start in January, according to the SMMT. Registrations rose by 2.9% compared with the same month in 2015 to reach an 11-year high of 169,678 units. And if the domestic economy also suffered, sterling would come under sustained pressure – due to the country’s current account deficit. It’s Bank of England Super Thursday — that time of the quarter when the UK central bank sets interest rates, and also releases its latest inflation report. “Super” could be pushing it, though. We’re expecting rates to remain unchanged at 0.5% (of course). The BoE will probably also lower its forecasts for growth and inflation, reflecting recent turmoil and rising pessimism about the world economy. 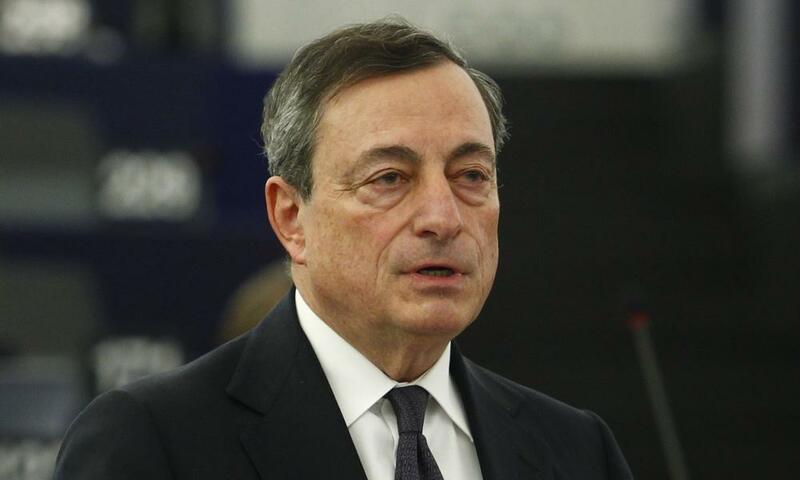 European Central Bank chief Mario Draghi is giving a speech in Frankfurt this morning; could that include fresh hints about ECB stimulus in March? In the corporate world, we’re getting results from oil group Shell and mobile network operator Vodafone, among others.